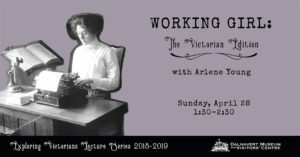 Join Arlene Young for a look at the jobs women held in the Victorian Era, with a particular focus on nursing and typing. This talk will take place in our Visitors' Centre at 1:30 PM. Coffee, tea, and treats will be provided! Member Prices: Individual $12 * 6-pack bundle $60 Non-member Prices: Individual $15 * 6-pack bundle: $78 Tickets available in house or email reserve@dalnavertmuseum.ca.